Are you looking for ideas for a tricky renovation? Take inspiration from Kim and Lewis Holmes' characterful converted schoolhouse in East Yorkshire, filled with interesting artefacts and unusual antiques. Find out how the couple salvaged and reused everything – from the tiles and bricks and tiles on the old toilet block, to the dark wood panelling in the hall – giving the old school and their antique finds a new lease of life. Lewis and Kim were expecting their son Django at this point, but moved in and prepared themselves to live on a building site while they took out fake beams and old units in the kitchen, removed a dividing wall and demolished the outside toilet blocks before starting work to reconfigure the interiors of the rest of the property. The kitchen was originally the schoolmaster’s house, the dining room was a gym, and the living room and main bedroom were classrooms. Kim and Lewis wanted to turn the area that had been used as a tea room into a living space and renovate the entire property using reclaimed materials. 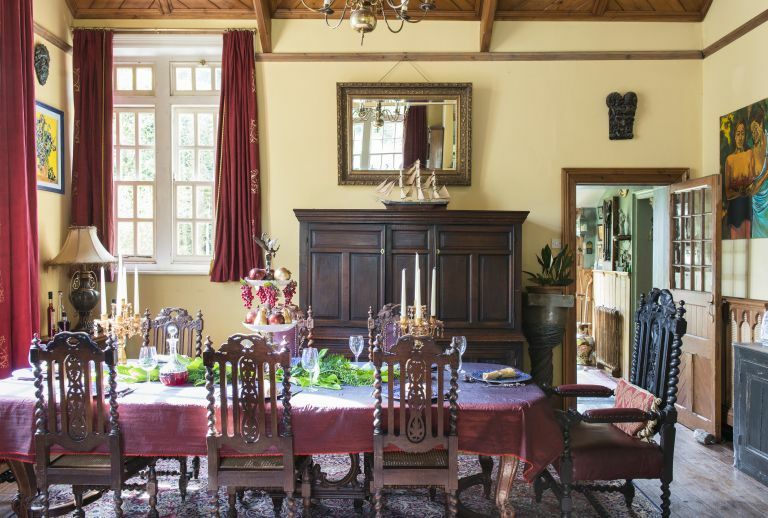 In the first few years, the couple insulated the ceilings and built a mezzanine in the living room to create an office and library, ingeniously using the steps, ornate gothic panelling and screen from a reclaimed pulpit to create the upper level. The pulpit staircase wasn’t quite high enough to reach the mezzanine so Lewis built it up, adding reclaimed columns, beams and four chunky stone steps. Lewis also built furniture and adapted cupboards using bits and pieces from his workroom, at the back of the old school. Complementing Lewis’ craftsmanship are Kim’s upholstery skills. She is adept at finding battered old chairs, which she strips back to basics and re-covers. ‘People used to stuff chairs with all kinds of things – I found a complete horse’s tail inside one, and another was full of silk stockings!’ she says. Kim also makes soft furnishings, restores wooden furniture by painting and ageing it and, as an artist, she has been able to create paint effects and trompe l’oeil ‘stone’ walls, as well as the colourful paintings that hang in the dining room. The result is a unique family home, full of history, character and cost-saving ideas.